Since Livechatoo is not just a communications but also a marketing tool, we have prepared a feature for you to automatically address visitors according to the conditions set in advance. Automatic triggers can be set by everyone, without distinction of the license. Automatic triggers, also called proactive chats, are an advanced tool that has many features. As we recently launched the Livechatoo link to Google Analytics, you can monitor the success rate of your triggers on the GA account and then subsequently tune the settings, so that they have a higher conversion. 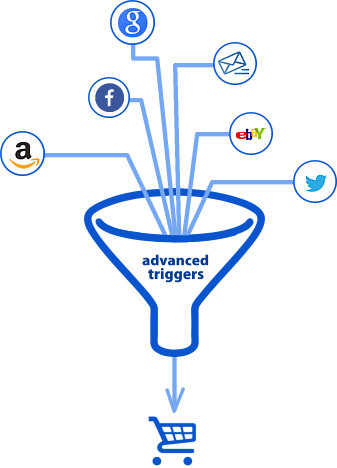 How can you set your triggers? The principle of the feature is that based on the set conditions, the trigger performs an action for you. For each trigger, you can set the time when it will be active and also days on which it will be run. Like this, you can differentiate between, for example, the greetings (good morning, evening, day…). Support of time zones is guaranteed. Here you can enter the name or URL address of the page where the client is located, or the previous page. You can also enter the URL address of the source page from where the visitor came. You can enter the exact chain or just any part that the chain should include. In addition, it is possible to enter a regular expression, which the site should/should not comply with. In this category you can adjust the trigger to the visitor’s behavior. You can set the number of seconds from the display of the current page, the number of displayed pages during the last visit, but also the total number of visitor’s displayed pages. You can define the visitor’s geographical position with multiple parameters. You can use, for example, the country code and name of the country. For a closer geographical identification, you may also specify the town or region in the form in which they appear to the Operator in the “Visitors” section. For sites with multiple language mutations, it is possible to set the trigger according to the chat window language. This condition enables to restrict the devices on which the trigger should be performed. You can choose a mobile device or computer. For the advanced determination of the client, you can also enter the operating system, browser or user agent chain. You can specify another trigger condition for statuses. The first option is the overall chat status – you can select Online/Offline. Other options are the statuses of the individual departments and operators. Under the conditions you can also select whether all the conditions are to be met to activate the trigger, or at least one of the defined. After all the defined conditions are met, you will probably send messages to the user most often. In addition, however, you can also send a notification to the operator that the conditions have been met. Another option is that you can change the client’s chat window to be maximized or minimized. In order to avoid looking like a robot, it is important to set it up so that the same message does not always appear to the client when they meet the conditions. If you set that the rule does not repeat for the customer, the same trigger will not be started anymore. Another option is that the same trigger will not appear to the user during the current visit, but next time it will again. Finally, there is the option not to show the trigger at a certain time. - Within one trigger it is possible to add an unlimited number of conditions. - A visit is understood as the time on the website from its opening to the closure of the browser. - In the exact chain you can use the “wildcard” character “*” (asterisk) by means of the “is/is not” condition, which replaces 0 or more characters. - If you are using regular expressions, they are required in the “pattern” or “/pattern/modifiers” form. You can use the strength of our triggers also when you do not need a chat on the site. How to do it? Create an account with us, put the generated Livechatoo code on the site, but set chat window as “hidden”. One golden rule at the end – try not to appear like a robot to the customer. Automatic addressing of each client after 5 seconds on the website can have the opposite effect of what you would have liked. « Adjust the chat design exactly to your liking!